I keep a comprehensive spreadsheet of fan-fictions that are complete, in progress, edited, commissions (in either stage), or simply ideas. I find that it helps me keep track of what is done, what I've promised sequels on, and the ideas that have hit me on occasion when I don't have time to write them! When a writer wants to change and grow, sometimes the only ally you have is yourself! Here are some tools that I've created myself or found elsewhere that really helped me grow. This meme was completed for "Final Fantasy VII". As you might guess from the title, I am the creator of this one. Though the lovely image (yes, I am making fun of it; I'm allowed because I made it) is geared mostly toward fan-fiction writing, you can also do the same exercise for a story of your own creation! Again, this is obviously another one of mine. This Fan-Fiction Writer's Meme is nine questions long and focuses on a single character. To the right, you'll see a portion of the one I filled out. As you can see, my character focus was Tseng from Final Fantasy VII . ~A scene that must contain the following words: "cupcake", "heart", "tears", and "luck". You get bonus points for using different languages. In the scene I wrote, I believe I used Spanish and Japanese. Aside from being massively amusing, this meme asks you to write five different moods (at least). This is something that helps you explore a character and your understanding of their reactions to different situations. -How does he act when he's embarrassed? -How does he set a romantic mood? -What could cause this character to cross-dress (and how does he react)? -How does he interact with someone he doesn't really like? -How does his behavior change in a sexual situation? When you fill out this meme, you have to ask yourself all of these questions... and more! One of the prompts is incredibly specific: you have to use four particular words in a scene, and they aren't exactly words you frequently see together. For me, this resulted in an incredibly zany situation. The last one was a request because I love Byakuya Kuchiki. I just wanted a few little ficlet centred around him. The real point, however, is sometimes, you don't get to write what you want to write. Again, you have to step outside of that comfort zone and reach for things that don't come easy. In addition, some of the people who complete this meme are unfamiliar with Bleach. One of my dear friends wanted to fill out this meme --"but I don't know anything about Bleach" she told me. My response was to send her links to three different images of him. I told her, "Just write whatever comes to mind about the man you see. Seriously, just a ficlet --it can be utterly AU!" Anyway! Now that I have ranted on and on about this one, I suppose you might want to know that you can find the blank meme here on dA. And hey: if you do end up doing this meme, let me know! Hm, wonder who made this one? Yeah, I probably need shot for touting my own work, but a girl's gotta eat! This fifty-two prompt challenge centers around a single pairing of your choice. (I had one participant ask to do a ménage trois; and by how I define pairing for this, it was perfectly acceptable.) They can be from your favorite novel, your favorite TV show, or your own creation. The exercises I selected (see: drempt up) were chosen for their vast variety. Odds are, if you check out the post on dA (or livejournal), you will find several you might struggle with. That's sort of the point --this is about becoming a better writer, so you're going to have to stretch some! If you chose to take part in this challenge, please follow the ground rules that are set forth in both posts! Also, this is now posted here! This is a little thing I've grown accustomed to from other fan-fiction authors. I'm not going to claim this as my original idea, but this is the one I've compiled for my personal use. I use a formula page for any stories I post for others to read --even my own fiction. The formula page helps you organize information, like who your central pairing is, what your summary is, and if it belongs to a universe you play with a lot. I often keep updating a formula page as I add more and more to a work. If you'd like to download the ones I use as an example, click here. If you'd like to see one in action, check out any of the stories posted on this site! 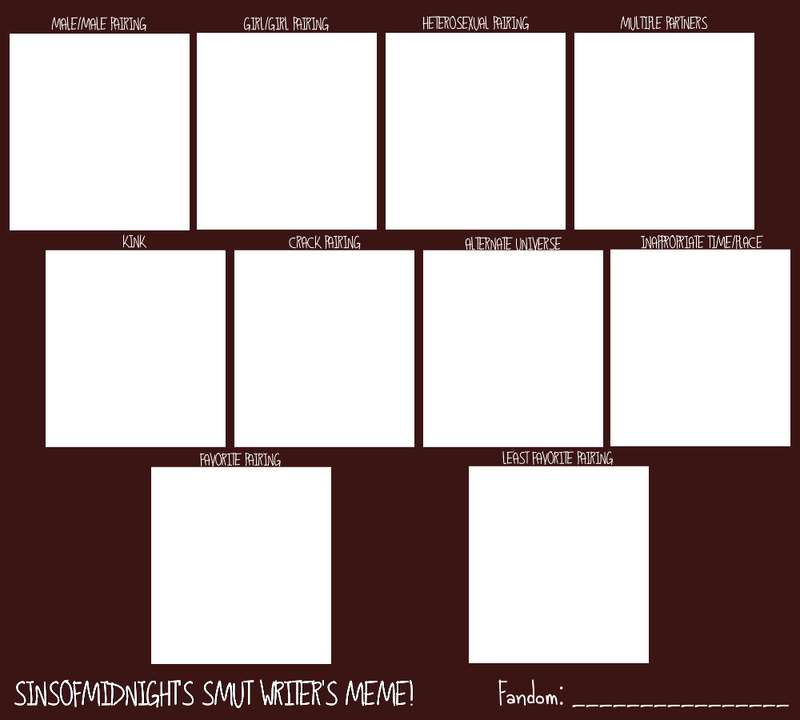 I've literally just printed them out to fill out for any story that needed one! Click here to download my template. I haven't gotten all of my tips, secrets, and tools through experience alone: I like to read books authors have written on writing. The best one I've read so far is "A Novel in a Year" by Louise Doughty. There is an exercise to complete each week (for 52 weeks) and lots of practical advice! Still, I'm always reading more of them, because I know that one author doesn't know it all!